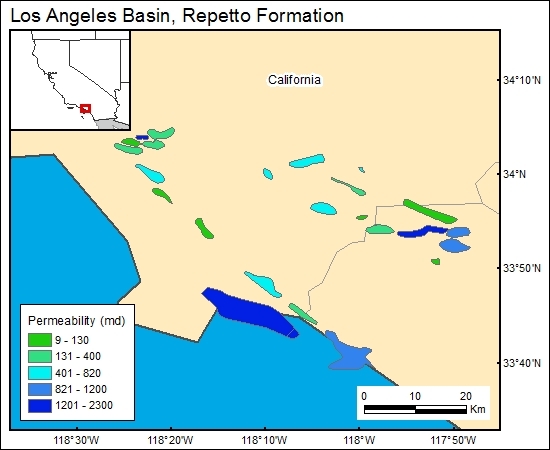 Permeability data of the Repetto Formation in the major oil fields of the Los Angeles Basin are listed in the California Department of Conservation (1991). Repetto permeability values exhibit a wide range, with values as high as 2,300 md in the Huntington Beach oil field. Variations in permeability in the Repetto Formation are related partly to the extreme lithologic heterogeneity, with reservoir facies consisting of conglomerates and sandstones in a silty and muddy nonreservoir matrix (Conrey, 1967).